I want my Win XP! 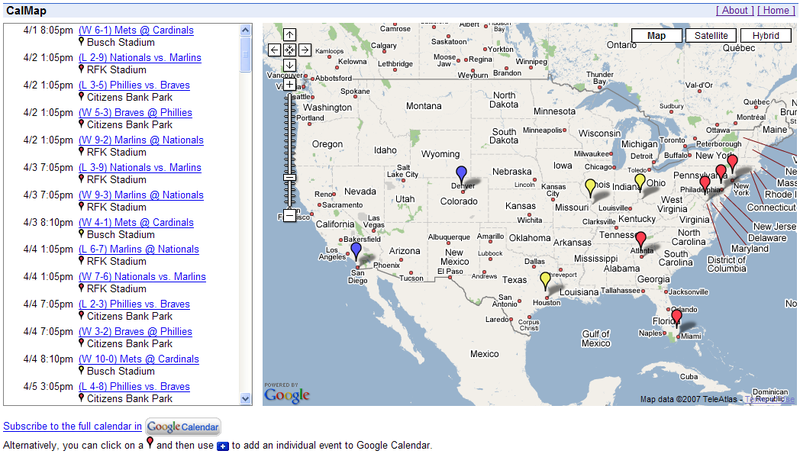 Currently, CalMap only plots the locations it knows, which are listed in a JSON data file. I also use this to assign marker colors so baseball teams in the same division will have the same color -- this makes the interleague games easy to pick out on the map! About a month ago, I spent an hour on the phone screaming (yes, literally screaming) at Dell because they had sold me a machine with Windows Vista. Admittedly, I knew that it would have Vista because when I ordered it online, I was not given the option to select XP. Fortunately for me, Dell recently reversed its decision to impose Vista on the world, so as soon as I saw the post on Slashdot, I got on the phone with Dell and demanded XP again. (After the previous conversation with them, I was planning to return the machine altogether.) This time, they acceded. You may be wondering why I wanted Windows so badly, and in particular, why Windows XP? A couple of years ago, I bought a Dell touchscreen (model E153FPT) in hopes of building my own little kiosk. It would have been ideal to hook it up to my Mac Mini, but I could only find drivers for Windows. Also, there are still a few things that I use that only work on Windows, such as X10 ActiveHome and the Google Talk client, both of which I would like to use on my kiosk. When I ordered the machine, I thought it might be fun to try out Vista, but instead it was a nightmare. The new UI paradigm where they hide the menubar by default drove me nuts (as I expected it would), and the popup situation is just as bad as the I'm a Mac "Security" claims it is. But the real deal breaker was when I discovered that there were no drivers for the E153FPT – I got on the phone and was furious that Dell would force me to buy a new machine with an operating system that was incompatible with other hardware I bought from Dell. The first time I called, the best they would do was sell me XP for $120 instead of the retail price of $200. I found this pretty outrageous as the machine I bought cost less than $500 in the first place. I'm happy that the problem is resolved, but after the second phone call, I had spent a total of two hours on the phone and had talked to at least seven people, all because I wasn't offered the option to select XP with my new machine on their web site in the first place. After my recent post requesting information about a Firefox-friendly Jabber library, it dawned on me that I should try searching for firefox xmpp library instead of firefox jabber library. Lo and behold, I discovered xmpp4moz! From the project web site, I downloaded the SamePlace Suite Firefox extension, which is a small suite of applications built on top of xmpp4moz. I fired it up and discovered that it contained a nice Jabber client written in XUL with explicit support for Google Talk. The only remaining question was: how did it work? I checked out the xmpp4moz code from the repository and started looking through it to figure out how it made a secure connection to talk.google.com. I immediately found some code that mentioned the starttls exchange that had thwarted my previous efforts to build a Jabber library for Firefox, but unfortunately it was commented out! After shooting in the dark for awhile with grep, I decided to find the entry point to the sign-on code and step through it. From what I have seen of the code so far, xmpp4moz looks to be an organized, well-designed library. I noticed that the developers make generous use of E4X, which is both convenient and brilliant since XMPP messages are in XML: all the more reason to develop a Jabber client within Firefox! But wait! Didn't I just say that the SamePlace suite already has a nice Jabber client for Firefox? Yes, it certainly does, but I want to explore building an HTML client with some of my own features, so leveraging xmpp4moz looks like the best way to do it!